Ronnie Lott consortium to Scupper vegas Move? Moving one of the NFL’s most storied franchise’s to Vegas is not as easy as many Raiders fans might hope. Even though Mark Davis has pledged $500million to help build a new domed stadium in Las Vegas, with backing from other owners, there are still plenty of potential problems with the move. The biggest reason the Mark Davis wants to move the team is the state of the team’s current stadium. The Raiders currently share a stadium with the Oakland Athletics, a major league baseball team. For those of you that have tuned in to various Raiders home games you will have noticed the random streaks of mud/dust across the field that is used for baseball games. It looks atrocious and just seems dangerous for the players. Not to mention the stadium first opened in 1966 and is horrendously outdated. 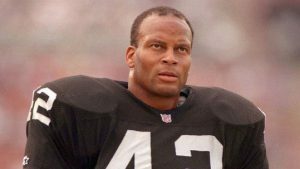 In the past week it has become apparent that an Investment group is trying to build a new stadium for the Raiders in the Oakland area, and is being led by ex-Los Angeles Raider cornerback Ronnie Lott. This group has recently got the backing of NFL commissioner Roger Goodell, who once again seems to be going against the owners and trying to make the league more and more his own little creation. Surely if the owner of a team wants to go he should be allowed to? More importantly, other owners have backed the move. Robert Kraft, owner of the Patriots and arguably the most respected owner in the league, has openly admitted that he supports the move. Kraft outlined that any of the risks associated with Las Vegas 10-15 years ago are no longer risks, paving a way for a potential move. Jerry Jones, owner of the Cowboys, also endorsed the move in a way, saying it has no disfavour with him after outlining the potential entertainment value of a team in Las Vegas.